The Galapagos Islands? Costa Rica? How can a remote archipelago made famous for Darwin, a bunch of finches, and other cool endemic birds be related to the land of quetzals and “gallo pinto” (that would be the local version of rice and beans)? Although Cocos Island is halfway between Costa Rica and the Galapagos, we are still talking about hundreds of kilometers of ocean between us and the place of the big tortoises. Really, there’s not much connection but thanks to the wandering ways of seabirds, Costa Rica does boast some loose links to that bucket list archipelago. 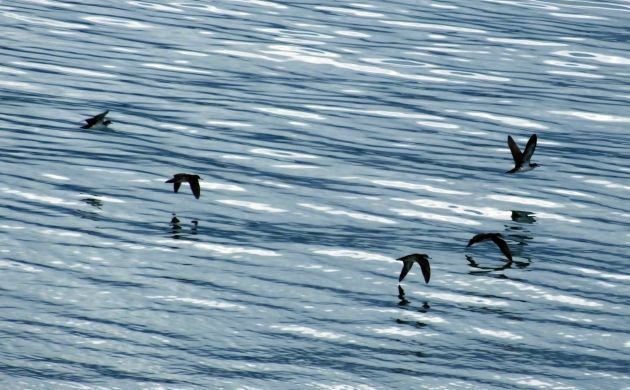 Seabirds that breed in the Galapagos aren’t exactly in our waters all of the time but at the moment, it does seem like Costa Rica has become a popular destination for the shearwaters. 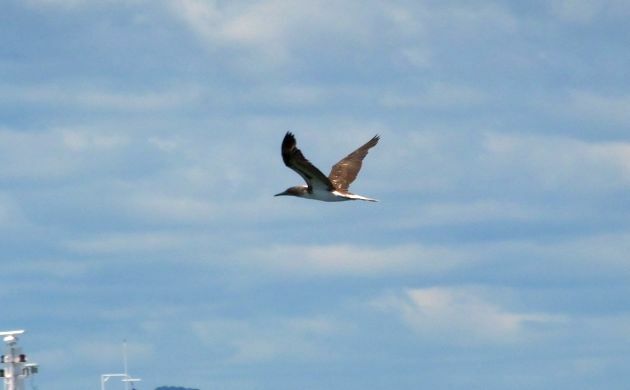 Within the past few weeks, several Galapagos Shearwaters have been reported in the Gulf of Nicoya and I bet if you took a boat out past the horizon, you would see a lot more. 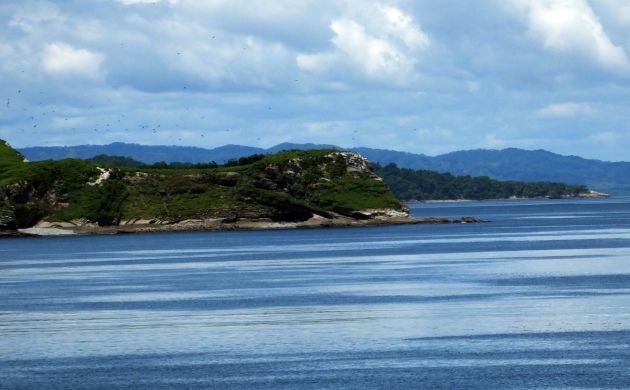 Yesterday, during a quick taste of pelagic birding from the Puntarenas-Paquera ferry, I saw around thirty of those pot-bellied duckish birds; more than I have ever seen in the Gulf than on any other ferry trip. The Gulf is seeing a lot of input from rain swollen rivers right not and I suspect therein lies the answer but whatever the reason may be, take a ferry now and it would be hard not to connect with this species. 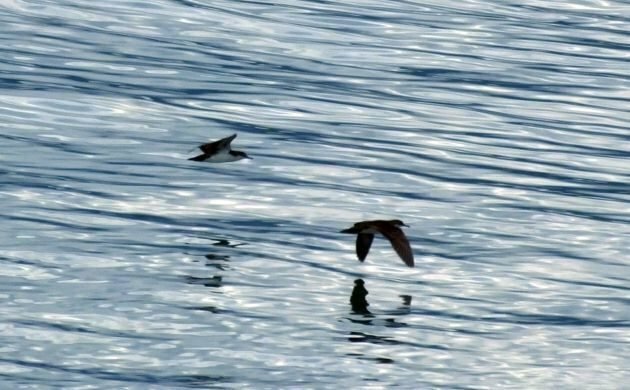 As the ferry plodded along, small groups of shearwaters lifted off the water to flutter and glide just above the surface. While scanning, I was pleased to note that I could find small flocks of them scattered here and there on the waters of the Gulf. At other points, they would join groups of Black Terns foraging for bait fish driven to the surface. While the terns screeched and dove, the shearwaters would rush into the fray, skid to a stop and then partially dive beneath the surface. While all of that shearwater coolness was going on, I failed to note any possible Black-vented Shearwaters (a potential lifer) but was nevertheless pleased with some of other arrivals. The scenery is nice too. I wish we could get closer to this island because scanning it with a scope from a moving ferry seems to be better for inducing dizziness than identifications. As expected, Black Terns outnumbered everything even though I only had a 150 or so birds instead of the several thousand that are sometimes logged in this area. Among them were two target year birds I was hoping for; Bridled Tern, and one flyby Brown Noddy. Although Black Storm-Petrel, Red-necked Phalarope, and Sabine’s Gull were no-shows, any possible complaints at missing them were negated by a sudden, mind-blowing occurrence of a Red-billed Tropicbird! Every time I do the ferry, I know this tern-like elegant bird is possible but connecting during one and a half hours of crossing the Gulf in a straight line is pure chance with low odds. On Wednesday, the odds finally fell in my favor when an adult tropicbird appeared like magic right in front of the boat. It’s amazing how these birds escape detection and their ability to do so shows why you will always have a major birding handicap when birding the sea on your own. When it happened, it wasn’t like I was reading a book, chatting, or taking a nap. As soon as that ferry got underway, I scanned the waves and horizon with binos and scope like it was a search and rescue operation. Any distant speck was checked, I looked at every bird, and always scanned for more. Even so, I didn’t see the tropicbird until it was right in front of the boat and even then, I figured it was going to be just another Royal Tern. However, thanks to good glass and fine lighting, the image became one of a white bird with black barring on the back, a black line behind the eye, and a thick reddish bill. I let out a gasp and almost yelled out, “tropicbird!” but knowing that I was the only birder there, stopped myself just as the magic year bird flew behind the boat. After I took my binos down, though, I couldn’t help but glance around at my fellow passengers in an automatic search for mutual excitement. I was probably mumbling “tropicbird” as I did so, but everyone was still doing the same old thing. The two French hippie/backpacker women were staring at their sandals. The guy sitting near me may have been sleeping. The Tico families laughing and talking. It was just another bird to them, even if they had seen it. The same goes for the occasional Blue-footed Boobies that flew past the ferry and flapped off the water in its path. Just another bird to most, to me, they were visitors that may have flown in from the Galapagos. How can anyone be blase when looking at a Red-billed Tropicbird? It bogles the mind. A Blue-footed Booby I can understand because you can’t always see those blue feet in flight. But, a Tropicbird? !